Take control of YOUR music collection. 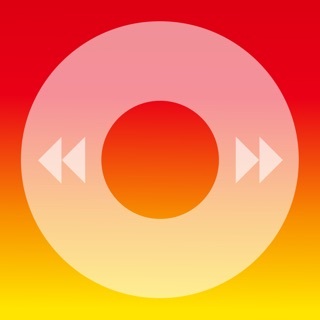 • Works with your iTunes Library automatically. • Deep sorting, collecting and navigation options (including playlist folder support) so you can explore your library exactly the way you want. • Clean customizable UI, including Night Mode and True Black. 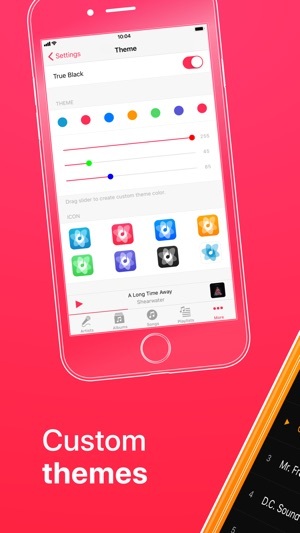 • PLAY, SHUFFLE and QUEUE tracks with a swipe: intuitive, gesture-based interface without clunky menus. 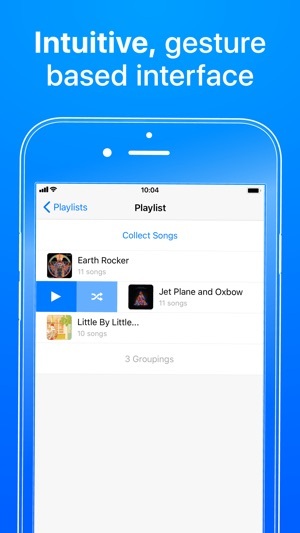 • GROUP tracks within a playlist to create perfect sets. • SEE all your track metadata and listening stats. 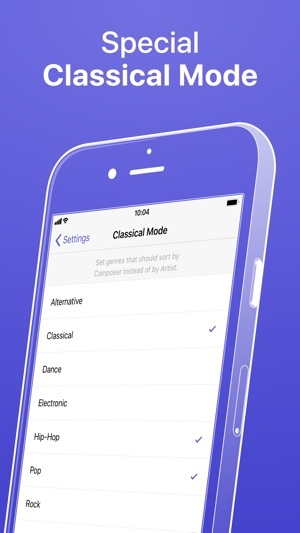 • USE Classical Mode for composer-centric genres. 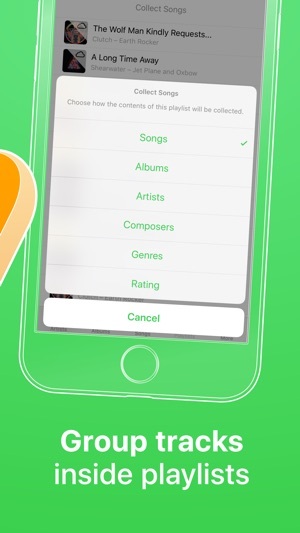 Cs requires Music.app to be installed. • Searching for the search bar? This update should fix some issues some users were having with no search bar appearing in the Search tab. Original review: Good. Still some issues. Has become quite laggy though or just less responsive to finger presses. More so than the Apple player in a noticeable way. Needs better scrobbler. It's not precise when's moving and the hit box for your finger to activate it is way too small. The one thing the new Apple Music player does well is an improved scrobbler. Copy nothing from Apple Music but that scrobbler user experience. The app is What Apple Music was and should be. It's better for large collections. It prioritized usability over eye candy in the cluttered/poor interface Apple Music app. that is probably there for people that don't actually have Music collections. Otherwise they'd want better navigation in the Apple Music app. If you want the old Apple Music player's layout, look, and general function back this is an app you'll like. It's what you've been looking for. And there's other customization like colors, mines all black with blue lettering, night mode style. And other options. I want to like this app, but it's pretty buggy. Sometimes when you press the home button or modify the queue, the song that is currently playing starts over. Sometimes when you add a song to the top of the queue, it doesn't play (it gets removed from the queue). Sometimes when you try to modify the queue, the changes don't get saved. Sometimes it hangs (I'm not talking about the iOS 11.2 lag, this is different) and sometimes it even crashes. It doesn't seem to update song metadata (e.g. 'last played' and play count) in a timely fashion. Songs that have just played still appear in the queue. If you add a long playlist (a couple thousand songs) to the queue, it reduces it to about 500 songs, I have no idea how it selects which songs to play when it does this. I've uninstalled and reinstalled the app and get the same results. I'm on iOS 11.3. Update for version 4.3: This app has gotten a lot better since the developer implemented workarounds for the Apple bugs. However, the Apple bugs still make it very difficult to modify the queue. Is there anything we can do to push Apple along? Post something on the feedback site perhaps? Shame on Apple for not fixing these bugs, they've known about them for a long long time. Sorry for the issues you are experiencing. The queue reduction issue has been fixed – update is in beta. Please email me at mike@cesium-app.com if you are interested in testing. Thanks! 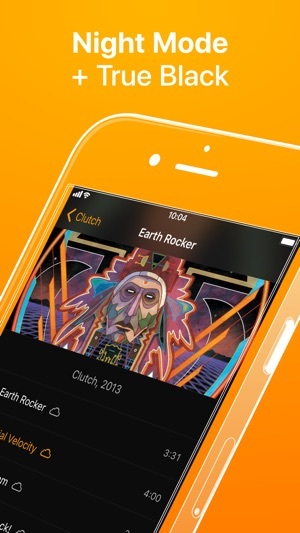 This app is an ideal replacement for Apple’s increasingly bizarre and user-hostile Music app. 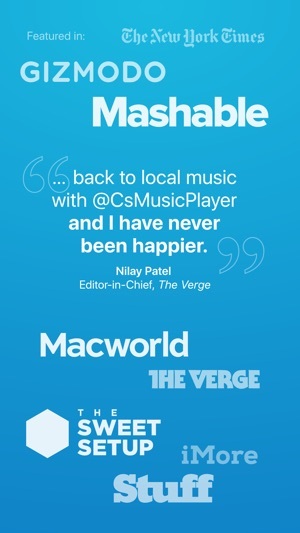 Cesium lets you listen to your music library conveniently and simply, just like the iPod used to. 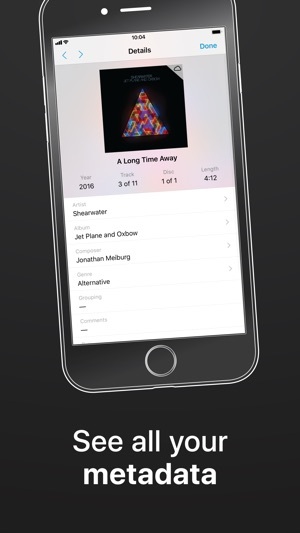 Artists are sorted sensibly by album, and you can also sort by track or album. It handles compilation albums well too. And best of all, you can shut off iCloud cleanly, so you can just see what’s actually on your phone - a simple concept that seems lost on Apple and most music app developers. 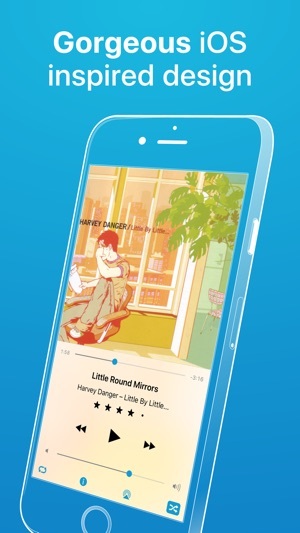 But overall, Cesium sets the standard for how a smartphone music app should work. Oddly, Apple itself actually set this standard in the first place but seems to have sabotaged it for no real purpose. It’s nice that Cesium still bothers to remember how it’s done.